Baseball’s top hitter and Wall Street power suits both ply their trades in a high-speed world. That hitter will make over a quarter-billion in the next decade. The top suits stand to ‘earn’ astonishingly more. Hitter extraordinaire Miguel Cabrera, even with his flush new contract, won’t come anywhere near entering America’s billionaire sanctum. Detroit Tigers infielder Miguel Cabrera may or may not turn out to be, by the time he retires, the best hitter in baseball history. But Cabrera already holds a historic distinction. Last month, just before baseball’s 2014 opening day, the 31-year-old slugger became America’s highest-paid professional ballplayer ever. Cabrera’s newly signed contract runs 10 years. Over that span he’ll receive paychecks totaling a record $292 million, a tidy sum that comes to a near $30 million annual average. An even more compelling stat: Every time Cabrera steps up to the plate over the course of the next decade, he’ll pull in an average $43,195. For a five at-bat game, Cabrera will clear over $215,000. How much revulsion should these numbers make us feel? On the one hand, Cabrera can do what only a relative handful of humankind can ever dream of doing. He can hit — with astounding regularity and power — a baseball coming at him at speeds up to 100 miles per hour. On the other hand, Cabrera plays half his games in the city of Detroit, a bankrupt metropolis that can’t afford to fix its roads, police its streets, or meet its promises to retired teachers. 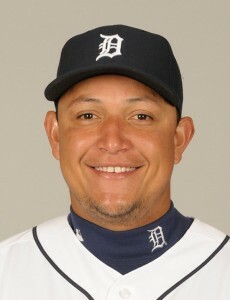 Cabrera will make more in a week this season than current Detroit teachers will earn over their entire careers. But these Detroit comparisons only take us so far. To truly appreciate the revolting significance of Cabrera’s new contract, we need to look up, not down. The rewards Miguel Cabrera will pull down pale against the windfalls now cascading into the pockets of America’s truly super rich, a fraternity that most definitely does not include Cabrera — or any other professional ballplayer. In 2012, America’s top 25 hedge fund managers — the elite of the financial services industry — averaged $565.6 million each. That average for a single year nearly doubles what Cabrera will take home over the next 10 years. America’s top 25 hedge fund managers are annually averaging over half a billion each. And how do the kingpins of high finance hit their incredibly generous jackpots? What exceptional skills do they demonstrate? They have no exceptional skills. They have only exceptional power, the economic and political capacity to bend the rules and rig the games they play — to our disadvantage. Last week a new book focused some long overdue public attention on one piece of that rigging. Miguel Cabrera hits high-speed fastballs. Our financial elite profit off high-speed trades. The best-selling author Michael Lewis vividly describes this world of high-speed trading in his just-published book Flash Boys. The wonders of high tech, Lewis explains, are letting Wall Street’s shiftiest see the shares other investors are buying and selling milliseconds before the overall market finds out. Armed with this inside info, high-speed traders can then make what essentially amount to sure bets. How sure? One high-speed trading hub, Virtu Financial, last month boasted that over the previous 1,278 Wall Street trading days, the firm had made money buying and selling shares of stock on exactly 1,277. High-speed trading may now account, the New York Times notes, for half of all shares traded. This enormous volume translates into huge windfalls for players like Virtu and the big banks, hedge funds, and stock exchanges that enable their high-speed trading. The losers amid this rigging? Average Americans with their pension fund savings invested in the stock market. Adept high-speed traders can make what essentially amount to sure bets. Miguel Cabrera may be outrageously overpaid, but he at least comes by his rewards honestly. Cabrera never knows whether the baseballs that pitchers hurl at him will come in straight or curved, high or low, inside or outside. He has to make all these tricky distinctions in just a fraction of a second. High-speed traders have their fractions of a second, too. But they don’t use their fractions to fashion skilled and honest decisions. They use their fractions to manipulate markets and make themselves fabulously rich. We could curb this manipulating in a flash, points out economist Dean Baker, simply by putting in place a tiny tax on each and every Wall Street financial transaction. Such a financial transaction tax may soon be in place in Europe. Legislation that would establish a similar levy stateside is currently pending before Congress — and going nowhere. Republicans across the board oppose the tax, and so do lawmakers in the Democratic Party’s hefty Wall Street-friendly wing. So what can and should we do? Let’s leave our uneasiness over Miguel Cabrera’s paycheck on the back burner. We have bigger fish to fry. We have, for starters, a financial transaction tax to win.